Editor’s note: This is a follow-up to a Feb. 6 article on a recent 45th Ward aldermanic forum at the Copernicus Center. 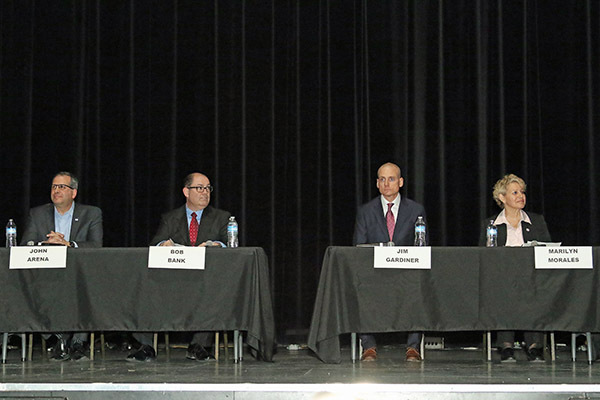 The final question at a Jan. 29 forum at the Copernicus Center asked 45th Ward aldermanic candidates to state in 10 words or less the top challenge facing the ward. "Lack of leadership," said Chicago Park District regional manager Marilyn Morales. "Finding leadership that is willing to work with constituents," said Chicago firefighter and part-time teacher Jim Gardiner. "Out of control, rising property taxes," said former Jefferson Park Neighborhood association president Robert Bank. "Our financial situation in Chicago, the pension crisis," said Alderman John Arena. Also at the forum, Arena, Morales and Gardiner said that they would continue the ward’s participatory budget process, which calls for a community vote on how to spend most of the ward’s annual allocation of $1.32 million in discretionary funds. The funds have been used for tree plantings, playground projects, crosswalk bump-outs, side-street resurfacing and other infrastructure improvements, and the process was started in the ward by Arena, who is finishing his second term as alderman. Bank said that he would not continue the participatory budget process because he wants more of the funds to go to side-street improvements, including curb and pothole repairs. Under participatory budget, ward residents have voted annually to allocate about half of the funds for street resurfacing. On the issue of affordable housing, all of the candidates except Bank said that they would support having more affordable housing (below-market rate) units in the ward. Affordable housing is intended for those households earning no more than 60 percent of the area’s median income. Bank said that the ward has plenty of reasonably priced apartments compared to other parts of the city, while Morales said that the ward needs more affordable housing but that the rent difference between affordable and market-rate units is not always significant. In addition, Arena said that the lack of a sufficient number of affordable units in the city is "a crisis," and Gardiner said that he would like to see affordable housing in the ward be targeted "for the people already living here" and feeling the pressure of being priced out of their home. Also at the forum, Gardiner said that he would not support reducing the number of aldermen in Chicago by having larger wards. He said that too many residents in the ward already are complaining about a lack of city services and that larger wards would not help the situation. Arena said that during the 2012 ward remapping, the possibility of having only 35 aldermen was explored and that he feels 35 is "manageable." Also, Bank said he would support a reduction in aldermen, while Morales said she would not. "First of all, it’s about keeping good relationships with the police department. Right now those relationships have been fractured thanks to the incumbent," Morales said. "We want to make sure we support our police, that we have their back." Morales said that she would hold monthly meetings with the 16th (Jefferson Park) and 17th (Albany Park) police district commanders and work with neighboring aldermen to get more officers assigned to the Northwest Side. Getting people, especially today’s youth, involved in positive activities that interest them can be a strong deterrent to entering a life of crime, Gardiner said. "To address crime and safety issues in the ward, I think it’s paramount to think outside the box. Earlier I talked about alternative methods to try to engage students in schools, and I talked about trying to teach the trades because not every student as I said is made to go to college," Gardiner said, calling for a "pro-active" approach to addressing crime. "Crime is up. It’s a fact," Bank said. He added that his son recently had a catalytic converter stolen from his car. Bank said that a recent increase in officers assigned to the Northwest Side is not sufficient and that more patrol officers are needed on each beat. "We’re not getting our fair share of police," he said. Arena said that while there is fluctuation each year in the number of reported crimes, "statistically the 16th District has been and continues to be the safest district in the city." He said that the crime watch section in the local newspaper does not illustrate what police are doing to solve crimes in the area. "We need to be persistent about crime and public safety. Make sure we’re engaging each other and look out for each other and report what we see and support the police in doing their job, and we’ll be fine. We’ll get through this, but it can’t be the sky is falling," Arena said.